After eventually winning the Ironman South Africa title again for the second time last year, five years after the first, I felt far less pressure to prove anything this year. There was the usual hype about who was going to be the top Saffa, but at the end of the day, all an athlete wants is to get the best out of themselves that they can on the day, and with a stellar international field, your best was certainly required. Weather conditions on race morning were near perfect, although the wind was blowing a little stronger than what I was anticipating, but as long as it stayed blowing from the southwest, bike times would be fast. By 6h45 all pre-race formalities had been taken care of and just over 1600 athletes lined up on the beach awaiting the 7am start of the 7th edition of Spec Savers Ironman South Africa. Quickly through transition, I was second onto the bike with pre-race favourite, 2009 winner and course record holder, Marino Vanhoenaker from Belgium along side me together with another strong contender in Australian, Luke Bell. The first job at hand was to catch the leader, so without hesitation, I got straight into working at my sustainable maximum effort. For the next 30km I rode on the front with no help from my two passengers, as we slowly narrowed the gap. Once the catch was made, I got a chance to see what dangers lurked in the group about 1m30sec behind us. Fellow South African (and PE local, when he’s in town, which is hardly ever these days), James Cunnama, had made up some time to catch the remnants of our swim group, and now seemed to be on a charge to try and catch us. But with his running prowess, I wasn’t about to let that happen, so continued to push on at a rather brisk pace. Soon Luke Bell was joining in with the pace making, but the two strongest bikers in the group seemed to be content to bide their time. After about 90km, Marino decided it was time to spice things up a bit, and as soon as he hit the front, Luke was off the back. The relentless pace started taking its toll on Bocherer at about 110km, and he lost a little ground. Everything seemed to be going perfectly according to plan for me until I got held up at an aid station trying to get water to refill my drink system (I apologise for some of the profanities that escaped in the heat of the moment). A slight gap opened between Marino and I, and it was all the motivation he needed to put the hammer down. After 30km of trying to close a 30sec gap, I reverted to my normal race strategy of trying to preserve the legs over the last 20km of the ride in order to save something for the run, so the gap blew out to 1m30sec by the time we started the run. Starting a marathon at 12h00 in the afternoon after 180km of cycling is never easy, but I’ve done it about 30 odd times before, so it’s nothing new to me. What was new was the fact that the 180km was ridden 6min faster than I had ever ridden before and 10min faster than I had ridden on this route before, so to say my legs were a little wobbly at the start of the run would be an understatement. In fact, my legs didn’t become wobble-free for quite some time into the run. In the meantime, Bocherer had managed to make up some time at the end of the cycle leg while I was resting, and passed me early in the run. Not being known for his running strength, I let him go straight past thinking I would see him again soon. The gap to the real runners in Cunnama and Daniel Fontana from Italy was a handy but certainly not safe, 7min and 9min respectively. For the remainder of the first 14km loop I struggled on, just trying to keep the two men in front of me within reach, and as I headed onto the start of my second loop, I started feeling the energy from the crowd lift me. The noise was deafening, but the chanting raised my adrenaline levels and I made my bid for the lead. Within the next 6km I went from 3rd place on the road, 1m30sec down, to leader on the road with a 10sec lead. But then the adrenaline was gone, and I was left alone in a very dark place. I kept fighting the fatigue as long as I could, but after "hearing” Marino’s name, and seeing Bocherer only 60sec behind at 30km (the last turn-around on the course, and chance to see your rivals), I decided to switch over to economy mode and try to preserve at least a 3rd place, instead of continuing to push and risking everything (I only needed to finish in order to validate my entry into the World Champs). 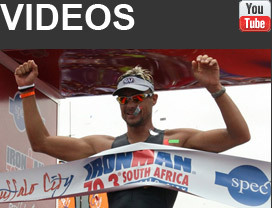 This was my 8th Ironman Title, and definitely a very special win on home soil in front of nearly 40000 spectators. The support out there was tremendous. The biggest thanks must go to my sponsors including Gu, Puma, Orca, Moducare, Oakley, Cycle Lab and particularly VELOCITY SPORTS LAB, and AXIS HOUSE. Trevor and his Team stepped in to be the driving force behind me when I was ready to quit., and have given me a new sense of drive and determination, to be the best that I can be. Next stop, the USA in June for some 70.3 races and training preparation for Kona.